Just got the latest issue of Journal of Book of Mormon Studies, published by the Maxwell Institute. This edition is not yet available online (hey, why not become a member and get it mailed to you? ), but when it is, be sure to read S. Kent Brown's article, "The Hunt for the Valley of Lemuel." While our critics are busy claiming that there isn't one scrap of evidence for the Book of Mormon, LDS thinkers are busy evaluating which of several good candidates are the most plausible for sites that uninformed critics have scoffed at as being too funny for words. A green, hospitable place called Bountiful on the eastern shores of Arabia?! Hah, every moron knows that the Arabian Peninsula is nothing but sand and desert - except, perhaps, for those modern and ancient morons who have explored Wadi Sayq or the Salalah region on the coast of Oman. And the mighty Valley of Lemuel with a "continually flowing" river of water that empties into the Red Sea? Every fool knows that there are no such rivers in Arabia! Except, perhaps, for those fools, ancient and modern, who exercised faith and traveled to Wadi Tayyib al-Ism about 75 miles south of Aqaba. Of the three candidates for the Valley of Lemuel, this is the one that S. Kent Brown finds to be powerfully compelling, though some questions remain unanswered. Some questions remain unanswered about exciting developments in Book of Mormon evidence, but more troubling is the fact that most questions remain unasked. Questions like, "What does the Book of Mormon actually say, and is there anything that provides plausibility for its message?" Or more specific questions like, "If Joseph Smith made up the Book of Mormon, how could he have gained access to detailed information about the Arabian Peninsula given in First Nephi - information that has eluded some of the most intelligent and highly educated anti-Mormon authors for decades?" In Acts 26, Paul stands before King Agrippa and relates his own First Vision account, an account of meeting the glorified and resurrected Lord Jesus Christ. As an aside, in Paul's three accounts of this vision (Acts 9, 22, and 26), there are some differences and even arguably contradictions (e.g., compare Acts 9:7 and Acts 22:9). However, his accounts, like the differing accounts of Joseph Smith's First Vision, can be integrated and understood to be different perspectives on a real experience. Paul was focused on preaching nothing but Christ, the Messiah prophesied by the ancient prophets and witnessed by living apostles and disciples in Paul's day. And this message of Paul about the grace of Jesus Christ, the Messiah, was this: that men should "repent and turn to God, and do works meet for repentance" (v. 20). That has been the message of God's prophets throughout history. It was a key message of Christ, it was a key message of Paul, and it is a key message of The Church of Jesus Christ of Latter-day Saints. Neither Paul nor we LDS folks mean that these "works meet for repentance" save you or earn your salvation, but they are part of what we need to do to really follow Jesus Christ and fully develop our faith in Him. It's the kind of message that can get you branded as non-Christian in some quarters, but it's core to true Christianity. So let's all strive to exercise faith in Christ by repenting of our sins, calling upon His forgiveness, and more earnestly following Him. He gives us power to do that if we will believe Him and trust Him. Thieves are near. What to do? Close your eyes. Tighter. Stop listening for footsteps - that will just make you nervous. Turn up the rap. Hide. There, feel better? Thieves? Yes, you've been robbed. If you finally open your eyes, don't check your wallet. It will have a lot less than it did before. Let's just not talk about that. Let's talk about sports. Anything besides the reality of insane inflationary spending and the devaluation of our currency by creating vast amounts of money out of thin air to pay for reckless spending all over the globe, for purposes completely unauthorized by the US Constitution. In the past year your money has lost 10% of its value - a conservative estimate. If you're getting 5% interest on your life's savings, you don't have 5% more - you have 5% less during this past year. And that's based on the US Dollar Index, which compares the dollar to the a batch of other world currencies - all of which are subject to inflationary pressures themselves as their central banks print up loads of paper money making their currencies worth less each year. The printing of fiat money and the associated inflationary expansion of the money supply is a hidden tax, an act of robbery, in which your government and our generous central banking system reduces the value of what you earn and save in order to finance their own agendas. The talking heads of Wall Street keep taking about the strength of the economy, the wisdom of stocks, the joy of the status quo, without letting you know that you're being robbed. Made 10% in stocks this year? You may not even have broken even. And if China and the Arab world grows weary of being on the losing end of the dollar, the sell-off of US treasuries could drive the dollar down rapidly and fiercely, disrupting far more than your plans for a European vacation. This is the time to be frugal, to build a food storage and emergency preparedness program for your family, and to consider investments that won't be sure to lose 20% or more of their value in the next couple of years. Naturally, I'm speaking to those of you in the US. If you're in Canada, for example, congratulations on the resurgence of the Loonie! What we are experiencing in the US now is not new. We are on the brink of what has happened many times. It happened in Rome. It happens all over the world. When a government assumes the power to create money without anything backing the money, when nothing but printing presses are needed to create and fund the dreams of politicians and bankers, when nothing but hope and trust is behind the printed bill, then the devaluation of that currency is inevitable, and the toppling of markets and even governments is sure to follow. It may take decades, but the end game can be swift and terrible. Rome, Weimar, Zimbabwe, even Kirtland - there are lessons to be learned. Our Founding Fathers learned that lesson. They knew history. That's why gold and silver were specifically spelled out as the basis for money. Congress had power not to print money, but to "coin" it, and no state would have power "to make anything but gold and silver coin a tender in payment of debts." Indeed, the details of the Constitutional Convention show that the Founding Fathers were ardent opponents of paper money. If we had stuck with that, we couldn't just print up money today, and all the advances in technology and productivity each year would make our dollar progressively more valuable, not less. Ah, what dreamers those men were! But they had their eyes wide open when it came to the danger of thieves. They did all they could to limit the size of government that we might be free, and free from the thieves that naturally gravitate to offices of power. The monopoly power to print money backed by nothing has got to be the most corrupting power of all. Who can resist that kind of fun? No thief can, that's for sure. 11 For both he that sanctifieth and they who are sanctified are all of one: for which cause he is not ashamed to call them brethren. . . .
Paul warns those who are already converted to give earnest heed to the Gospel, to not slip away. Obviously, one can fall away and depart from the faith - one of the downsides to the terrible but wonderful gift of agency that we have. Paul reminds us of our relationship to Christ. Though God, He is also our Brother. How? Because we are sons and daughters of God, even his "offspring" as Paul taught in Acts 17: 28-29. We call God our Heavenly Father for good reason, for He is the Father of our spirits, as Paul also teaches in Hebrews 12: 9-10. And Christ, who descended here with mortal characteristics, made a little lower than the angels, came to bring many of God's sons and daughters unto glory (verse 10). And through Christ and His sufferings, we can become one with one and more fully be brethren (verse 11). Here the King James translators may have simply choked on the Hebrew word that they translated as "angels." I'd be more comfortable saying angels myself, and can understand their stress. In fact, life would be a whole lot easier for us Latter-day Saints if we simply talked about being angels in the kingdom of God as the blessing awaiting those who accept and follow Christ. But the Hebrew word in Psalm 8 is "elohim" meaning "gods." A little lower than the gods. And it makes no sense if you assume it means human-made idolatrous gods. Tonight I called my mother in Utah and learned of an event that she can only describe as miraculous. I have her permission to share it here. This year she became ill with a curable kidney problem. When I saw her in September, I was quite concerned. Her legs were terribly bloated from water due to the kidney problem. It made it hard to walk, caused discomfort in many other ways, and really looked bad. She had gained about 40 pounds of water. We were very worried. The doctors put her on a group of medications and told her it could take a year or longer to get the bloating down. Many have been praying for her, and my father gave her a reassuring priesthood blessing a couple weeks ago. But there seemed to be almost no progress. The medications were having little detectable effect. About a week ago, one of her gentle cats did something most unusual. Out of the blue, for no obvious reason, it went over to her while she was seated and scratched her leg. She looked at the scratch and wasn't worried. It was pink, but there was no bleeding. Later she noticed a little water was oozing from the wound. And then came more, and it kept oozing and dripping out of her leg. She called a nurse who said this could be serious, and asked her to check in to the emergency ward. A doctor checked her out and said she was OK, and if the scratched helped get rid of water, then let it be. Over the course of the past six days, she has lost 31 pounds of fluid. The bloating is largely gone, and people tell her she looks 20 years younger. It amazes me. Sometimes, when the Lord in his mercy decides, for whatever reason, to intervene and work a miracle, He often sends someone else to help. Sometimes it's an angel, a visiting teacher, or a bishop. And now I know of at least one case where it seems that He sent a cat. ScienceDaily.com reports on an article on DNA testing to be published in the prestigious journal, Science. Its warnings on the limitations and misapplications of DNA testing have implications for the DNA attacks on the Book of Mormon. Some critics rail against the Book of Mormon because DNA testing of modern Native Americans does not appear to point to the Middle East as the primary ancient source of early Americans. Such attacks rely on outdated and overly simplistic assumptions that are not supported by the text itself. ScienceDaily (Oct. 20, 2007) — For many Americans, the potential to track one's DNA to a specific country, region or tribe with a take-home kit is highly alluring. But while the popularity of genetic ancestry testing is rising - particularly among African Americans - the technology is flawed and could spawn unwelcome societal consequences, according to researchers from several institutions nationwide, including the University of California, Berkeley. "Because race has such profound social, political and economic consequences, we should be wary of allowing the concept to be redefined in a way that obscures its historical roots and disconnects from its cultural and socioeconomic context," says the article to be published in the journal Science. The article recommends that the American Society of Human Genetics and other genetic and anthropological associations develop policy statements that make clear the limitations and potential dangers of genetic ancestry testing. Tests cannot determine exactly where ancestors lived or what ethnic identity they held. . . .
"While some companies carefully explain what genetic ancestry tests can and cannot tell a test-taker, other companies provide less information about the limitations and assumptions underlying the tests," said Deborah Bolnick, assistant professor of anthropology at the University of Texas and lead author of the article. For example, there are mitochondrial DNA tests, which trace the mother's lineage, and Y-chromosome tests which track paternal ancestry. The test-taker swipes the saliva inside his or her cheek, and sends the swab to the lab. The DNA is extracted and compared to samples from a reference database of haplotypes - a set of inherited, linked genetic markers - to see if there's a match. Because these tests trace only one bloodline, however, they exclude most ancestors. Moreover, they cannot pinpoint where these ancestors lived. "Each test examines less that one percent of the test-taker's DNA and sheds light on only one ancestor each generation," the study says. . . . Publication date in Science, October 18, 2007. These warnings about the limitations of DNA testing have been made by LDS researchers for some time. Some unqualified critics have twisted such warnings to suggest that they were attacks on the scientific quality of DNA work itself. Far from it. Real science requires constant caution and consideration of the assumptions being made, the limitations of a method, and the range of what can and cannot be determined from any given experiment. And when we apply that kind of scientific rigor to DNA testing and the Book of Mormon, we have to conclude that it is simply unreasonable to expect to find definitive traces of Lehi's or Sariah's unknown genetic haplotypes among modern Native Americans 2600 years later, when they may have represented an easily lost drop in the bucket of incoming DNA in the ancient Americas. The goodness of God leads us - but does not compel us - to repent. And we need to repent, for we will be held accountable for our deeds. As verse 7 indicates, God gives eternal life "to them who by patient continuance in well doing seek for glory and honour and immortality." Gasp - that sounds like that dread cult featured in The Godmakers. Can any real Christian possibly think that patient enduring in faith unto the end is expected of them? And what can we say of those lost souls who dare to seek glory, honor, and peace in the kingdom of God? God, of course, is just. He is no "respecter of persons." In the end, He is fair to all, regardless of whether they are Jew or Gentile, born before or after Christ, or born in a nation where Christianity exists or not. He does not arbitrarily will some to suffer in hell and others to go to heaven, independent of the choices and actions of humans in response to the gift of grace that He offers. Romans 2 presupposes that we have at least enough agency to choose God and repent, and to be held accountable for what we do, whether we choose to patiently follow God and receive the gift of eternal life, or to choose to rebel against God and receive something far less. We are accountable, we have agency, and we need to repent and "obey the truth." Obey?? Ah, there is that hallmark of both modern and ancient cultists: the ever-offensive call to obey, as if our obedience and endurance had anything to do with accepting the grace God offers. Christ.org is a great place to learn how to experience the full joy that Christianity can bring. So glad to see this! Awesome domain name. I suggest we all add a link to it! Are You Protecting Your Child from the Risk of Suicide? During a recent lunch with a respected educator in the area, I learned a few things about some frightening trends regarding suicide among young people. He had just attended a regional seminar in which an noted psychologist talked to the group of educators about the growing threat of suicide among young people. The expert indicated that the risk for suicide among young people has been increasing dramatically, and that there is reason to believe that violent video games are one factor (of many) in this trend. She noted that graphic video games teach people the actions needed to kill, including actions that can help you kill yourself, and the training appears to be taking a toll. Another deadly trend it the "hanging game" that has become popular among some groups of kids. This has resulted in death that may appear to be suicide, when it was not intended. Sept. 6, 2007 -- There is a sharp rise in suicides across the board in teens, says the CDC. They are up 76% in girls aged 10-14, up 32% in girls aged 15-19, and up 9% in boys aged 15-19. It's the biggest spike in 15 years, the CDC's latest teen-suicide statistics show. "This is a dramatic and huge increase" in pre-teen and teen suicide, Ileana Arias, PhD, director of the CDC's National Center for Injury Prevention and Control, said at a news conference. "We are seeing this increase in significantly younger Americans than we have seen in the past." The data cover the year 2004, the latest year for which numbers are available. The CDC collects the information from death certificates. Because coroners and medical examiners don't always have enough information to conclude that a death was a suicide, the actual number of suicides is likely to be higher than the official number. The new numbers reverse a decade-long downward trend in teen and youth suicide. It's too soon to know whether 2004 was an unusual year, or whether it marks the beginning of an upward trend. But the data suggest disturbing changes. One disturbing change is the uptick in girls and young women committing suicide. The other disturbing change is that hanging or asphyxiation is becoming much more common -- particularly among 10- to 14-year-old girls. The rate of suicide by hanging/asphyxiation more than doubled to 68 per 1,000 girls aged 10 to 14. Since 1990, when the CDC began keeping records, this rate was never higher than 35 per 1,000 girls in the same age group. It's possible that this new trend toward hanging and asphyxiation is linked to a choking game that has recently become popular among schoolchildren. As its name implies, the "game" usually involves using the hands, rope, or fabric to choke another child until he or she loses consciousness. The payoffs appear to be the brief "high" achieved during the loss and regain of oxygen to the brain, and the amusement derived from seeing a peer become disoriented. In addition to peer influence spreading something so stupid and harmful as the "hanging game," suicide by shooting and other forms of violence may have some connection to all the graphic violence that we allow our kids to revel in. Link Between Suicide and Video Games? [P]arents may not know that the content of certain games could affect the social and emotional development of their child, and may even be hazardous to children's health. Violence is the most prevalent health risk for children and adolescents. Homicide, suicide and accidents are the top causes of death for 15- to 24-year-olds. Each year, more than 150,000 adolescents are arrested for violent crimes; more than 300,000 are seriously assaulted; and 3,500 are murdered. Violence done to and by America's young people is a public health emergency that must be addressed by parents, physicians and policymakers. More than 3,500 research studies have examined the association between media violence and violent behavior. All but 18 of the studies have shown that the more violence one sees, the more likely one is to be violent. According to the AAP, depictions of violence that are realistic, portrayed without pain and suffering, and experienced in the context of good feelings are more likely to be emulated. On April 20, 1999, two heavily armed adolescent boys walked into Columbine High School in Littleton, Colorado and shot 12 of their classmates and a teacher to death. Then they killed themselves. When authorities investigated, they discovered that the boys had played thousands of hours of a "first-person shooter" video game that had been modified to occur in a layout identical to that of their high school, with yearbook pictures electronically pasted onto the game's imaginary victims. What led these boys to deliberately kill their fellow students is complicated and no single reason has been identified as the cause. One of the questions parents asked after the Columbine shooting was: "How could it be that the parents did not know their children were playing such heinous video games?" The answer is that parents are not familiar with video games because they don't play them. Parents don't know that video games that have a mature rating may contain content that is entirely inappropriate for children under the age of 17. They don't know that a child playing an M-rated game can actively participate in the simulated murder of police officers, women, minorities and innocent bystanders. These acts are graphically depicted and include victims being shot, beaten to death, decapitated, burned alive and urinated on. These games may also present favorable depictions of prostitution, racism, misogyny and drug use. Parents do know that children learn by observing, imitating what they observe, and acting on the world around them. According to child psychologist Michael Rich, children develop what psychologists call "behavioral scripts." They interpret their experiences and respond to others using those scripts. One can easily see how repeated exposure to violent behavioral scripts can lead to increased feelings of hostility, expectation that others will behave aggressively, desensitization to the pain of others, and an increased likelihood of interacting and responding to others with violence. "No Way! This is All Garbage - Video Games ARE NOT Harmful"
ISU Distinguished Professor of Psychology Craig Anderson, Assistant Professor of Psychology Douglas Gentile, and doctoral student Katherine Buckley share the results of three new studies in their book, Violent Video Game Effects on Children and Adolescents (Oxford University Press, 2007). It is the first book to unite empirical research and public policy related to violent video games. Anderson and Gentile presented their findings last week at the Society for Research in Child Development Biennial Meeting in Boston. The book's first study found that even exposure to cartoonish children's violent video games had the same short-term effects on increasing aggressive behavior as the more graphic teen (T-rated) violent games. The study tested 161 9- to 12-year-olds, and 354 college students. Each participant was randomly assigned to play either a violent or non-violent video game. "Violent" games were defined as those in which intentional harm is done to a character motivated to avoid that harm. The definition was not an indication of the graphic or gory nature of any violence depicted in a game. . . .
"Even the children's violent video games -- which are more cartoonish and often show no blood -- had the same size effect on children and college students as the much more graphic games have on college students," said Gentile. "What seems to matter is whether the players are practicing intentional harm to another character in the game. That's what increases immediate aggression -- more than how graphic or gory the game is." Another study detailed in the book surveyed 189 high school students. The authors found that respondents who had more exposure to violent video games held more pro-violent attitudes, had more hostile personalities, were less forgiving, believed violence to be more typical, and behaved more aggressively in their everyday lives. The survey measured students' violent TV, movie and video game exposure; attitudes toward violence; personality trait hostility; personality trait forgiveness; beliefs about the normality of violence; and the frequency of various verbally and physically aggressive behaviors. The researchers were surprised that the relation to violent video games was so strong. "We were surprised to find that exposure to violent video games was a better predictor of the students' own violent behavior than their gender or their beliefs about violence," said Anderson. "Although gender aggressive personality and beliefs about violence all predict aggressive and violent behavior, violent video game play still made an additional difference. "We were also somewhat surprised that there was no apparent difference in the video game violence effect between boys and girls or adolescents with already aggressive attitudes," he said. . . .
A third new study in the book assessed 430 third-, fourth- and fifth-graders, their peers, and their teachers twice during a five-month period in the school year. It found that children who played more violent video games early in the school year changed to see the world in a more aggressive way, and became more verbally and physically aggressive later in the school year -- even after controlling for how aggressive they were at the beginning of the study. Higher aggression and lower pro-social behavior were in turn related to those children being more rejected by their peers. "I was startled to find those changes in such a short amount of time," said Gentile. "Children's aggression in school did increase with greater exposure to violent video games, and this effect was big enough to be noticed by their teachers and peers within five months." The study additionally found an apparent lack of "immunity" to the effects of media violence exposure. TV and video game screen time was also found to be a significant negative predictor of grades. The studies reported in this book provide the most rigorous and compelling evidence to date about the harmful effects of violent video games. In particular, the authors' longitudinal study of video game violence effects should silence the critics who complain about the validity of short-term, experimental lab research. Policy-makers will cite this research as a cornerstone in their future efforts to address concerns about video game violence. These and related studies have not addressed suicide per se, as far as I know, but I think it is fair to recognize the possibility of a link. If violent behavior and attitudes in general can be increased by the interactive training created by violent games, it would seem fair to worry that violent games can make the suicide threat even greater for many young people. No, no, no - I'm not saying that Halo 3 or any other game is going to turn little Suzy into a murderous maniac who runs out and blows herself up. But if your children are struggling emotionally or facing difficult challenges in life, is violent training and a 3-D violence-filled environment the best way to help them cope? Perhaps they will be better helped a little more family scripture study, more service opportunities, and longer family home evenings as alternatives to blowing their peers to bits. Hey, it's just my opinion. Call me crazy! Whatever challenges Russia has faced in the past in terms of religious liberty, I'm delighted that this nation has taken a bold and lonely stand to resist the total loss of Christian religious liberty in Kosovo, a position I base on Aleksandar Pavic's article on the betrayal of Christians in Kosovo by the West. Two words for Russia on this matter: ochen harasho! (I think that's how you say it.) And thanks! Warning: What I'm about to report may be offensive to dentists or other health care workers in Utah and elsewhere. Let me first state that Utah has many great dentists, and I think that most dentists, LDS or otherwise, are decent and honorable. In fact, all the ones I currently know in Wisconsin and out West are ones that I think are honest are trustworthy. But there may be some disturbing exceptions. . . .
Tonight I had two people in my home tell me about how they had a puzzling diagnosis from dentists in Provo, Utah. One, when she was a young married student at BYU years ago, had a Provo dentist tell her that she had 10 cavities suddenly show up, allegedly due to the biochemical changes associated with pregnancy. She was skeptical, got a second opinion, and found that she had no cavities. Another, a recent BYU grad, visited a dentist and had the hygienist tell her that she had a "disgusting mouth" with about 10 cavities, after which the dentist told her she had at least 8 and needed a lot of work. She was puzzled because she just had a check up six months before and had been practicing outstanding dental hygiene. He said there were marks showing that she had just had her braces off and these were related to early cavities. She resisted and explained that it had been 10 years since her braces were off, after which the dentist backed down and said she didn't need work after all. After coming to Wisconsin, dentists praised her for having such great teeth - and no cavities. My stomach sank as I heard these stories, for I had a similar experience in Provo - with less wisdom on my part. After returning from my mission, I went to a trusted family dentist in Salt Lake who gave me a clean bill of dental health. No problems at all. But in Provo, a little over a year later, I saw a dentist who told me news that shocked me. My mouth was heavily decayed with 22 cavities! It would require a lot of work - a lot of expensive work that would take up a lot of what I was earning. I hadn't been diligent enough in flossing, I suppose, but I couldn't imagine how I could have developed so many cavities. The dentist, knowing I was a recently returned missionary, said this happens frequently to returned missionaries. Two years of inadequate dental care can catch up with you quickly, and perhaps the problems that had been building up were still too small for the Salt Lake dentist to have noticed. Changes in food and other habits can all contribute, blah blah blah. Well, who was I to question the authority of a skilled dentist? As a gullible returned missionary in Zion's shielded outpost of Provo, I trusted and paid through the nose for the work in my mouth. For many years I've have been embarrassed over how many cavities I had filled - over 20! - and wondered how I could have been so stupid as to have let my teeth go so bad so quickly so shortly after my mission. And now tonight, I felt even more stupid. Perhaps my teeth were fine. Perhaps I was exploited. I hope not, but it's possible. How stupid to not get a second opinion. Maybe my mouth was somebody's gift horse. When you get a medical or dental opinion that doesn't seem right, do the drill of getting a second opinion. Question authority. You can't undo a filling or most other procedures. Is there such a thing as Mormon cigars? I feel this need to hand them out to celebrate the return of my son from his two-year mission in the Las Vegas Nevada West mission. 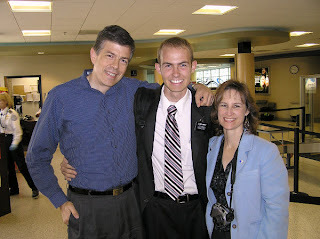 Just picked him up at the airport, took him and the family to dinner at Texas Roadhouse, and am now waiting for his official release with the Stake President in a few minutes. Not sure if Mormon cigars are the appropriate gift. Maybe some fresh Wisconsin cheese curds. Wait, I know - smoked cheddar, a Wisconsin specialty. His mission truly exceeded my expectations. How he's grown, and what a wonderful time he had among the fabulous people of Nevada. Thank you, thank you, thank you to all the wonderful members and investigators and friends of the Church that took care of my son, that listened to his messages, that fed him, helped him, and made his experience so memorable. What a terrific experience he had. It changed his life, he told me tonight, and it really shows. He's so much more confident and exudes happiness. I'm amazed at how he has grown and at the miracles and blessings he has experienced, things that have greatly strengthened his testimony of the power of the Gospel, and mine. If you're in the Fox Valley area of Wisconsin, feel free to drop by my home on Sunday, anytime from 4:00 to 7:00 pm, for a reception for my son. I have a cell phone with a jazzy ringtone. It's been ringing a lot recently, and I've become very attuned to its sound, especially the first three or four notes. Too attuned, actually. In noisy environments with any kind of musical tones present, there are likely to be a few faint notes that simulate some of the notes of my ringtone, and then I instinctively reach for my phone, only to find that it was a false alarm. This can happen with almost any kind of music except rap (no actual notes, I guess?). It doesn't have to be formal music, either. The other day some of the random grunts, whistles, and rattlings of the loud air conditioning system at Appleton's Avenue Mall made me reach for my cell phone several times while I was sitting in a "quiet" place. Worried about my sanity, I walked into the Lindsay Do-It-Yourself Free Mental Health Prevention Clinic (a free service that is fully covered by my health insurance) and gave myself the surprise diagnosis: Phantom Ringtones. I'm not necessarily crazy, but suffer from the tendency to find or even imagine familiar notes in all sorts of settings, causing me to think that I'm hearing a familiar tune when it is really something else. Wow, I'm suffering from Phantom Ringtone Disorder. The doc, a somewhat shady character, said he's not sure he remembers what the cure is, but if I upgraded from the free service to his very expensive weekly therapy sessions, it would come back to him. Phantom Ringtone Disorder, the ability to falsely recognize your own ringtone from faint noises around you, often occurs when we are not close to the source and aren't really paying attention. If we were closer and listening carefully, we might have less trouble distinguishing background music or the whinings of machines from the ringtones we use. Phantom Ringtone Disorder can affect both sides of religious discussions. For example, in discussing the scriptures, it's easy for us Latter-day Saints to see a few words that resonate with LDS themes and think the verse is "playing our song." And it's easy for Latter-day Saints to get excited about some discovery or legend from Peru or Canada or elsewhere and find parallels to the Book of Mormon, when the timing and location may make it not highly relevant to anything in the Book of Mormon. Sometimes a few of our faith promoting rumors, discoveries, or even experiences might really be Phantom Ringtones, in a sense. It's also easy to see symptoms of Phantom Ringtone Disorder in the responses of some of our critics or even friends as we discuss and debate scriptures and religious history. To those steeped in popular traditions about the nature of salvation, no matter how clear a verse of scripture seems to us about our need to obey or keep the commandments as our response to faith in Christ, those notes become morphed into the ringtones of "salvation by faith only," "obedience = false gospel," etc. Even repeated statements from Christ such as "If thou wilt enter into life, keep the commandments" (Matt. 19:17) become morphed 180 degrees into "he was just showing how futile and wrong it is to think that we can keep the commandments." But then our responses must be just about as frustrating on other topics. How do we get past this? Getting closer to the source, and asking what something really means rather than "how does it agree with what I already think?" Examining our assumptions in approaching a problem - or even just recognizing that we are bringing assumptions and biases to the table. Easier said than done, of course. The solution isn't easy (expensive weekly therapy at the Lindsay Mental Health Prevention Clinic might help), but for now I'd at least like to point out the problem. Our most familiar music can be so ingrained in our minds that we find our music everywhere we look, when in fact, quite a different tune may be playing. It's related to the problem of tapping out music that's in your head - it's hard to understand why others are such idiots that they can't recognize our tune from the tapping. Tap -- tap ---tap, tap Tap tap, tap Tap tap; - "No, it's the theme from Starwars, you idiot! Am I the only intelligent one around here??" The Journal of Experimental Biology has a short summary of a technical paper (PDF file) on the way a limbless reptile, the amphisbaenian, is able to burrow so effectively in the ground. This rarely studied Brazilian creature is able to dig extensive tunnels using only its head, a feat that is quite difficult to explain. Navas and his team began investigating the muscle's structure, and found that the amphisbaenian's muscle fibres were incredibly long, angled at up to 35°, and curved around the reptile's body, increasing the muscle's effective cross sectional area and power output. Amphisbaenians have found a way of increasing aerobic muscle's force production while maintaining stamina to keep the slender reptile burrowing for hours. Amphisbaenians found the solution? Just a minor nit to pick here, but why is it that when a genius-level solution to a problem is found in nature, there is often praise for the creature (so bright, these limbless critters), and praise for the scientists who figure out what the solution is, but little praise for Anybody Else? In conclusion, to build underground galleries, the digging muscles of Leposternon microcephalum must be designed to produce forceful, powerful and repeated contractions of the head. That's fine. Let the reader decide who gets congratulated for the brilliant design. Praise the critters, praise Darwin, praise the authors, or praise the Designer who may have lent a helping hand to some limbless diggers somewhere along the way. Your call. Who Says that Jesus Christ is Not Enough? 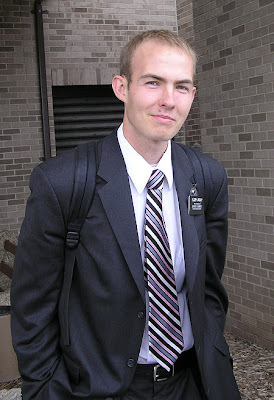 I was giving somebody a ride recently when he volunteered that they had been to Temple Square in Salt Lake City where he learned about the Mormons. Then he said, "One thing I didn't like is the idea that the death of Jesus Christ on the cross and His Resurrection was not enough for salvation." My mind raced to memories of Temple Square. I couldn't recall any exhibits with labels like, "Jesus: The Inadequate Messiah," "Why Jesus Christ Doesn't Cut It as Savior," "Why You Don't Need Jesus: How to Resurrect on Your Own," or "Do-It-Yourself Eternal Life." But could there be something new in the missionary discussions for visitors to Temple Square? "Hi, welcome to Temple Square. We'd like to tell you why Jesus really isn't enough for salvation." Resisting the instinct to hit the passenger-side ejection button (a cool custom feature on my 1998 Toyota Camry), I asked where he got such a notion. Didn't get much of an answer to that question, but I'm confident that this "Jesus is not enough" argument isn't based on anything he learned at Temple Square, but from the spin of someone who is not trying to be fair and honest about the Church. The real objection, it turns out, was the idea that we need to follow Jesus by doing what He said - i.e., the hideous concept of "keeping the commandments." I took a few moments to explain that Jesus Christ is the only source of salvation, that His infinite Atonement truly is enough for all of us and is what we all truly need, etc., and that, yes, we feel that we need to follow Jesus in a covenant relationship to gain access to the full blessings of His Atonement - not that we can "earn" one iota of our salvation by anything we do. I also reminded him that the objection may be more an issue of semantics than a real divide in our thinking, since we both insist that man must believe in Jesus Christ to be saved, and we both agree that human behavior will change to comply with the teachings of God as a result of that belief. Though time was limited and I didn't want to press, I did remind my friend that there are several passages in the Gospels where Jesus was asked how one gains eternal life, and in response, he said things like, "If thou wilt enter into life, keep the commandments" (Matt. 19:17). I asked if it would make sense to condemn a religion as non-Christian for accepting this basic teaching of Christ? I hope he heard a few of these words. "The formal doctrine of the Trinity as it was defined by the great church councils of the 4th and 5th centuries is not to be found in the New Testament." Boldly refuting our critics who claim we aren't Christians because we don't accept some of the extra-Biblical doctrines, Elder Jeffrey R. Holland's Saturday afternoon General Conference address included some hard-hitting comments. In addition to testifying of our obvious commitment to Jesus Christ and our sincere and devout worship of Him as our Savior and Son of God, Elder Holland specifically took on the critics who say we aren't Christians for not sharing their views on the Trinity. While we believe that the Father and the Son are One in every meaningful way - one in heart, purpose, will, etc. - our understanding of how they are one does not include the perplexing formulations of an immaterial single being of three persons and one substance or other post-New Testament formulations that were heavily influenced by Greek philosophy. After pointing out that the metaphysical doctrine of three persons of one substance and Trinitarian formulations evolved long after New Testament times in councils of men, Elder Holland cited multiple verses from the New Testament illustrating that the early Christian understanding of the Godhead was consistent with the understanding of modern Latter-day Saints, an understanding that came as part of the Restoration of the Gospel of Jesus Christ. His purpose was not to say that Trinitarians are not Christians! Rather, he was clarifying our status and demonstrating the irony of other Christians saying we are not Christian for failing to accept modern doctrines foreign to Peter, Paul, and the early Christians. While we disagree with the modern concept of the Trinity, those who believe it are still Christians in our book. We may be concerned that some of their doctrines are incomplete, but we don't scare others into thinking that other churches aren't even Christian just because we disagree in how we interpret the scriptures. Some tough love from Elder Holland - but nicely handled, I thought. We believe in one God, the Father Almighty, maker of all things visible and invisible; and in one Lord Jesus Christ, the Son of God, the only-begotten of his Father, of the substance of the Father, God of God, Light of Light, very God of very God, begotten, not made, being of one substance with the Father. By whom all things were made, both which be in heaven and in earth. Who for us men and for our salvation came down [from heaven] and was incarnate and was made man. 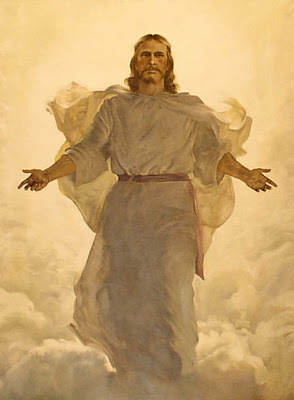 He suffered and the third day he rose again, and ascended into heaven. And he shall come again to judge both the quick and the dead. And [we believe] in the Holy Ghost. And whosoever shall say that there was a time when the Son of God was not, or that before he was begotten he was not, or that he was made of things that were not, or that he is of a different substance or essence [from the Father] or that he is a creature, or subject to change or conversion--all that so say, the Catholic and Apostolic Church anathematizes them. That is, there is only one God, but that God is composed of three distinct persons who share in the same substance or essence. Was this the original interpretation of the scriptural passages in question? Modern scholars agree that the Nicene view introduced new elements into the standard interpretations that had not been accepted by the earliest Church. For example, Maurice Wiles concludes that, "The emergence of the full trinitarian doctrine was not possible without significant modification of previously accepted ideas." Plato, realizing the material world was ever changing, speculated that it was impossible to obtain true knowledge by observing the natural world. But he had faith that true knowledge was possible, so he posited an unchanging, perfect world that was a higher reality than the material. He called this region or dimension the world of "Ideas" or "Forms." These "Ideas" were considered the perfect essences of various objects or attributes. For example, a waterfall and a person can both be said to be "beautiful" although they seem to have nothing material in common. Plato suggested that there must be an "Idea" or essence in the world of Forms--perfect and unchanging--called "The Beautiful," in which both the person and the waterfall participate. Similarly, Plato's idea of God was a perfect, unchanging, indivisible essence known as "The Divine," or "The One." Xenophanes and Empedocles expressed similar ideas of what God must be like. Xenophanes (570-475 B.C.) conceived of "God as thought, as presence, as all powerful efficacy." He is one God--incorporeal, "unborn, eternal, infinite, . . . not moving at all, [and] beyond human imagination." And Empedocles (ca. 444 B.C.) claimed that God "does not possess a head and limbs similar to those of humans . . . . A spirit, a holy and inexpressible one . . . ."
Therefore, in the Greek world it was more acceptable for the Christians to say that there are three, distinct persons who are a single "Divine essence or substance"--or as Plato would say, "The Divine." But these three persons cannot be said to be three Gods, because the divine essence must be indivisible and simple. Many Christians envision the Trinity as three "centers of consciousness" within the one God, but even this is inadequate to express the ineffable reality of God. Consistent with this conception of the "Divine Substance," God cannot be said to be a material being, for matter is a lower reality than a pure "Idea." Thus, the ancient Greek philosophers and modern mainstream Christians would agree that God is incorporeal, without a material body or human emotions, immovable, indivisible, and therefore ultimately incomprehensible to humanity. This theory of the nature of God began to be adopted into Christian thought in the late second century. Christopher Stead writes that the early Christian writers Irenaeus (A.D. 130-200), Clement of Alexandria (A.D. 150-215) and Novatian (ca. 250) believed in a God who is "simple and not compounded, uniform and wholly alike in himself, being wholly mind and wholly spirit . . . wholly hearing, wholly sight, wholly light, and wholly the source of all good things." This, Stead points out, is almost identical to Xenophanes' assertion that "All of him sees, all thinks and all hears." And "since Clement elsewhere quotes Xenophanes verbatim, we have good grounds for thinking that Clement's description, and indeed the theory as a whole, derives from Xenophanes." Thus, we see that to interpret what is meant by the mainstream Christian creeds, we must appeal to the ideas of the Greek philosophers. We also see that the concepts of deity derived from these sources are contrary to the doctrines and teachings presented in the New Testament. Malcolm Gladwell's recent best-seller, Blink: The Power of Thinking Without Thinking, tells the story of the "Love Lab." The "Love Lab" began around 1986 when Dr. John Gottman joined the University of Washington Department of Psychology and started the Family Research Laboratory to investigate the health of relationships between couples. In his work, he has studied thousands of couples, bringing them in to be interviewed and studied. They are videotaped as they are interviewed. Researchers are trained to identify numerous emotional states as they review the tapes. These states are encoded and stored, describing a few seconds at a time of the video with a Specific Affect Coding System (SPAFF). The laboratory also uses video heart rate monitors, measures of pulse amplitude, jitteriness and skin conductivity. All this information is combined and entered into mathematical models to assess relationships and predict their trajectories. Over the years, Dr. Gottman's techniques have proven remarkably effective in predicting the success of relationships. One emotional state, if identified in the video taping, has proven to be the most powerful predictor of marital trouble: contempt. Researchers are trained to identify even brief moments of contempt. Rolling of the eyes as the partner speaks, for example, can be a sign. But when it is there, trouble is brewing, on the average. Actually, four factors are important predictors of trouble: defensiveness, stonewalling, criticism, and contempt (Gladwell, pp. 32-33). But contempt is the most important: if a partner expresses contempt toward the other, the marriage is in trouble. Gottman has noted that contempt is far worst than criticism, for contempt is speaking from a superior plane, and it's far more damaging and degrading to the partner. It puts the other on a lower plane than you. Gottman has found, in fact, that the presence of contempt in a marriage can even predict such things as how many colds a husband or wife gets; in other words, having someone you love express contempt toward you is so stressful that it begins to affect the functioning of your immune system. "Contempt is closely related to disgust, and what disgust and contempt are about is completely rejecting and excluding someone from the community. The big gender difference with negative emotions is that women are more critical, and men are more likely to stonewall. We find that women start talking about a problem, the men get irritated and turn away, and the women get more critical, and it becomes a circle. But there isn't any gender difference when it comes to contempt. Not at all." Contempt is special. If you can measure contempt, then all of a sudden you don't need to know every detail of the couple's relationship. Contempt is an emotion that also seems to be far too common in religious conflict. It's fine to disagree with another religion - this can be done civilly and with respect. But when the critic looks down on the adherents of another faith and sees them as utterly beneath him or her, as fools and clowns to be mocked and despised (i.e., "ministered to in love"), then we've got trouble. There are some online forums where contempt is the name of the game. Don't think you are going to learn anything meaningful about another religion from a source filled with contempt, even if the source appears to have credibility because they used to be belong to the religion under attack. They may cite factoids and scripture and historical events, but the spin will be that of an enraged ex-spouse right after a bitter divorce explaining, after a few beers, why his former sweetheart always was the devil incarnate. Latter-day Saints must also beware the Satanic trap of contempt. Yes, we have something to offer the world, but other religions have plenty to offer us, and have wonderful traditions and reasons for membership that we cannot glibly discount. We can disagree with their views on critical topics and discuss what we have to offer, but never assume we are on a higher moral plane than someone else, Christian or not, and never speak or think from a position of contempt for what they have or who they are. It happened again. I tried to avoid it, but I let just a touch of flippancy creep into a conversation with an Omniscient Being, and as a result, he has ignored my petition. He initiated First Contact and I have proof of his existence, but I fear that my response was unworthy. Note to self: In dealing with Omniscient Ones, be more humble and agree quickly - otherwise they won't answer my email. I really can't blame you for taking a defensive position when it comes to The Book of Mormon, but it is extremely disturbing for me and others to read that you actually believe that it is an ancient work. But what is more disturbing is that you and others of your kind buy into the notion of supernatural beings. What nonsense. I don't know if rational thinking will ever prevail, but given the advances made to date, there is still hope. Interesting. What is your evidence that there are no supernatural beings - or no beings more intelligent than those on this little planet? Seems like that would be an extremely awkward position to defend scientifically. Do you mean to tell me that you have explored the entire universe and can definitively assure us that there is nothing out there superior to us? Doesn't that require a certain amount of, say, omniscience? I can understand agnosticism - but the position you seem to take is surprising - or, as you might say, disturbing. May I ask how you arrived at it? And then I'd like to know why you would be so disturbed at those who don't share your views. Are you sure that this is completely rational? Did I say something wrong? Maybe he was unhappy with my technically inaccurate blending of "supernatural" with "extra-terrestrial," but I thought it was a relevant question, just for starters. I mean, if there are beings elsewhere more intelligent than us, isn't it possible that there could be a Being who is Very, Very Much More Intelligent? And if that's possible, well, why rule out the possibility of one or more Beings whose powers to us might even seem a tad on the supernatural side? See where this is going? Seems to me that one has to be Omniscient, even supernaturally so, to rationally rule out the possibility of what we might call Supernatural Beings. And it appears that I had First Contact with a Supernaturally Omniscient Being (SOB) - and then I blew it! Drats, I keep offending SOBs. What should I have said instead? How would you have responded? For my offensive reply, I fear that I will be consigned to Outer Dorkness. The Church in Vancouver? The Real Promised Land? Any of you from Vancouver? Curious to know how the Church is doing there. I'll be in Vancouver briefly in October as a speaker at the Licensing Executives Society 2007 Annual Meeting for a panel on university-industry relationships, where I'm representing Innovation Edge. Very exciting topic, IMHO (but please don't get me going on the topic of pending patent reform legislation and what that might do to universities!). I see an LDS Temple is under construction in Vancouver. That's good. I understand that Vancouver Island was one of the destinations contemplated for the Latter-day Saints before they left Nauvoo. Like Salt Lake City, Vancouver offers great skiing nearby. But after you're done skiing, you can go fishing, canoing, golfing, or swimming on the beach - on the same day. One of the most amazing climates and recreational regions anywhere. Now that's a real promised land!